It wouldn't be an Asylum film without beating the release date of the film it's copying. Yup, it's their Mad Max ripoff. 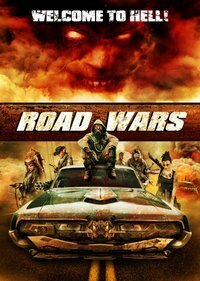 Mad Max: Fury Road will be released on May 15th and Road Wars is releasing ... wait for it ... May 5th! Oddly, Asylum has had a lot of success doing this. And they make Z Nation. God Bless capitalism! Not at all a fan of Asylum. But, remember how many badass OG Mad Max ripoff there were in the 80s? And how great a ton (hell all IMO) of them were! Bring on the PA! I think I saw a zombie. wow they must have made this with the leftover cars from the road warrior that weren't destroyed. 70's vibe, dystopian desert, horrible acting and meaningless car chasing?? ?